Many thanks to our Life Members and their Partners for supporting our Icebreaker Race. After Race: Prize giving and BBQ on the beach at 1700 hrs. - everybody welcome. 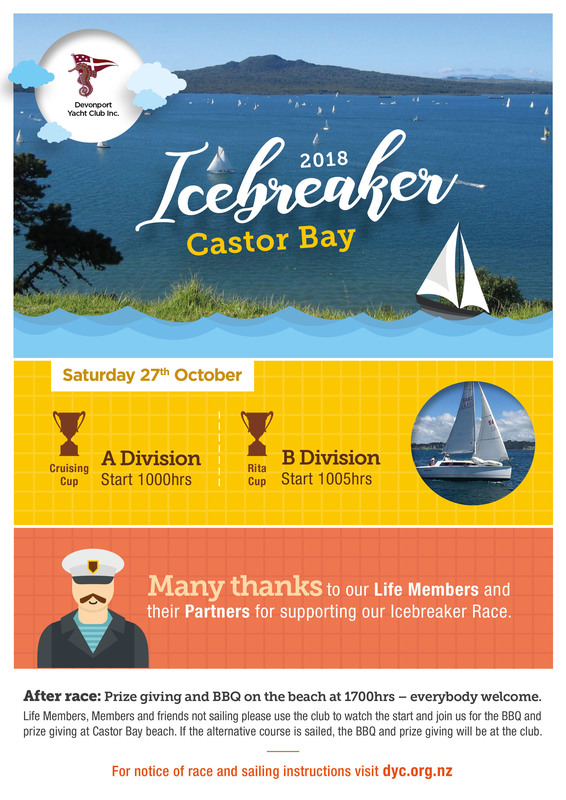 Life Members, Members and friends not sailing please use the club to watch the start and join us for the BBQ and Prize giving at Castor Bay beach. If the alternative course is sailed, the BBQ and Prize giving will be at the Club. 27/10/2018 10:00:00 Finish Elapsed Corrd. Line Hcp. 27/10/2018 10:05:00 Finish Elapsed Corrd. Line Hcp.